Living in Philadelphia, one of the things I enjoyed as a young teenager was heading over to Six Flags Great Adventure for all the awesome rides that it has to offer. But Six Flags doesn’t just give you the fun rides it gives you entertainment as well for the whole family. Now with Halloween being upon us this weekend the Fright Fest at Six Flags is in full swing. Bring out all those scary monsters and zombies. The park literally transforms with ghouls jumping out from everywhere. The hubby and I got to experience the fun, thanks to Pepto-Bismol for the invite. 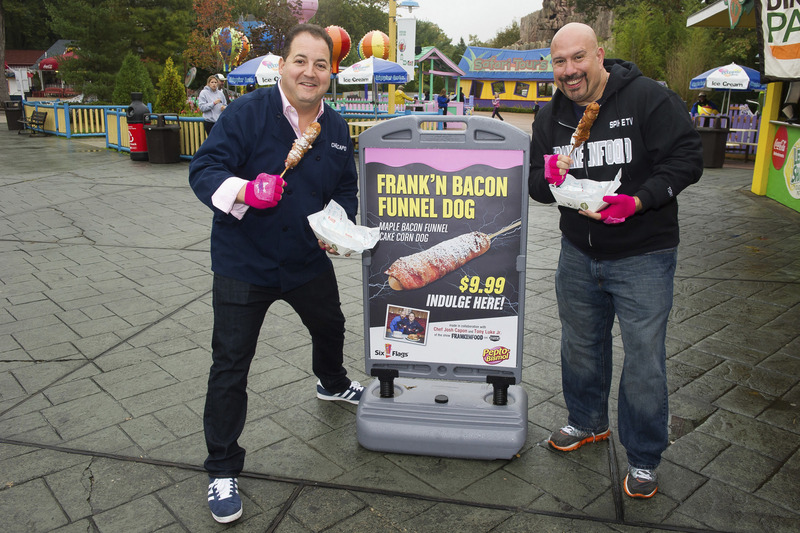 The partnership between Six Flags and Pepto-Bismol along side with the hosts of the new Spike TV show Frankenfood, Chef Josh Capon and Tony Luke Jr., created a crazy but tasty combination item that is sure to blow your mind its The Frank’n Bacon Funnel Dog will be available at select Six Flags parks beginning Saturday, October 11. So as you eat this tasty crazy dogs you will probably need some relief after going on some roller coasters and spinning upside down. Don’t panic the pepto copter is there to save you. All you have to do is “Tweet for Relief” at the first sign of stomach trouble and have Pepto-Bismol deliver on demand via the Peptocopter street team during designated times throughout the promotional period. How great is that. Fright Fest is definitely a favorite of our family. There is fun for the whole family during the day the park is kid friendly with magic shows and some trick or treating on some of the trails and seeing some of the charcters handing out candy. But as night time falls six flags turns into a scary thrill like I mentioned.